We created a design inspired by the Chanel Resort 2013 collection - the line featured pops of floral shades, layered lace & ruffles. Using China Glaze For Audrey (a classic Tiffany teal shade) and Color Club Hydrangea Kiss (a cornflower blue, and the most used in the collection) we created an ombre design using a makeup sponge. Tip: paint nail the lighter shade (For Audrey) and apply darker shade (Hydrangea Kiss) to makeup sponge to stipple down the nail; it helps to be light handed as you can always layer if the design is not dark enough. Once the sponge ombre design is completely dried, use a nail art pen to create your design. The Chanel Resort collection had ruffles and lace on almost every single piece and we tried to replicate the delicate detail. The design looks more impressive then it actually is - a good nail art pen can be used just like a felt tip pen. If you are a beginner level nail artist, make your designs make bigger - bigger semi circles, 2-3 peaks, etc - with practice you can create smaller designs. Start at the base creating rows of semi circles alternating between each other - 3 to 4 layers in total, about 1/3 down the nail. 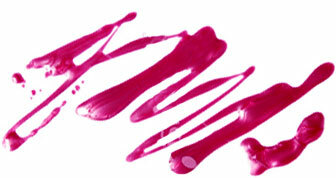 Using the nail art pen create pointed tips, to look like the edge of lace. Finally using a dotting tool (a straight pin in an eraser, or bobby pin can be used as a substitute) create 2 dots on the tip of each peak. Seal in the design with a great top coat - we used Seche Vite!